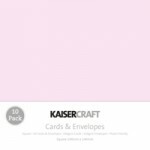 Kaisercraft square card pack - Baby Pink. 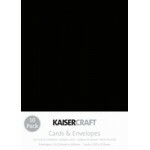 Contains 10 cards and envelopes, 140mm x 140mm ..
10 pack of cards and envelopes, C6 cards 107mm x 152mm, envelopes 114mm x 162mm ..
Kaisercraft square card pack - Black. 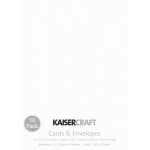 Contains 10 cards and envelopes, 140mm x 140mm ..
Kaisercraft square card pack - Cream. Contains 10 cards and envelopes, 140mm x 140mm ..
Red square card pack by Kaisercraft. COntains 10 cards and 10 envelopes. 140mm x 140m..
Card pack 10 cards and envelopes - C6 - 107mm x 152mm envelopes - 114mm x 162mm ..
Kaisercraft square card pack - White. Pack includes 10 cards and envelopes, 140mm x 140mm ..